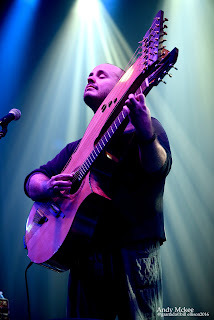 Tickets on sale Friday, January 12, 2018 at 10 a.m.
January 8, 2018 – Orlando, FL – Dr. Phillips Center for the Performing Arts in association with AEG Presents announce Andy McKee. With his signature live energy and exceptional skill, McKee magically transforms the steel string guitar into a full orchestra on Saturday, March 10, 2018 at 8 p.m. Tickets go on sale to the general public Friday, January 12, 2018 at 10 a.m. Tickets start at $29.50 and may be purchased online at drphillipscenter.org, by calling 844.513.2014 or by visiting the Dr. Phillips Center Box Office at 445 S. Magnolia Avenue between 10 a.m. and 4 p.m. Monday through Friday, or 12 p.m. and 4 p.m. Saturday. Online and phone ticket purchases are subject to handling fees. Live performances of Andy’s became such a point of fascination with his loyal followers that in late 2015, Andy decided it was time to release a live album. Featuring tracks from his entire catalog, Live Book was recorded live in December 2015 at The Melting Point in Athens, GA, the Red Clay Music Foundry in Duluth, GA, and Workplay in Birmingham, AL. McKee went through the recordings from all three shows and selected the finest takes of each set. Reflecting on the song choices, he looked to provide current fans the chance to relive their favorite shows, in hopes that he can showcase the energy he creates for those who haven’t been able to attend a show and new fans alike. Live Book released worldwide on April 22. The album, McKee’s first live record, was released through CGP Sounds. In support of the new album, McKee is now embarking on “The Next Chapter Tour” throughout Europe, Asia, and the United States.